Last week someone sent me a link to this site and until today I didn't have time to go and have a look. 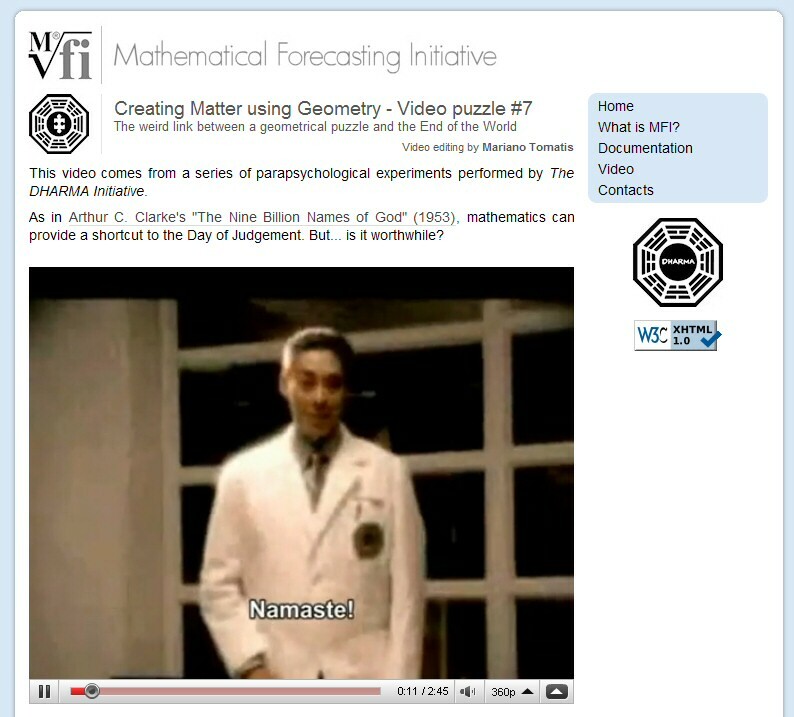 The Mathematical Forecasting Initiative is supposedly and offshoot of the DHARMA Initiative and has some interesting threories about mathematics and numbers in general. There are some entertaining videos with Dr Marvin Candle and lots of mentions of Valenzetti and the numbers. While I'm reasonably sure that this not an official ABC or LOST produced website, as it is Italian in origin and has the initials of a defunct furniture sales chain in the UK, it is rather interesting for those that have followed LOST ARG's in the past. I thought it was about time for a new post and this looks rather nice although I don't think it is anything official. Hi Zort! So glad to "see" you! Hi Ellen, I'm usually around just not posting much at the moment. Lots of things in real life to deal with. Real life... ugh! who needs that! Hi Ellen, hi Zort. Interesting site. Well- first thing I notice is the videos were produced at "Ann Harbor"-so that does sound like someone listened to the name and just translated it wrong! Hi Zort-yes-TRW is definitely a hindrance sometimes. :( no chocolate in this house. I made homemade chocolate turtles...the candy. That's it for me. French toast and will definitely be in a food coma watching this laker game. Enjoy the awesome weather! I was wondering when no one was saying anything at all. Good to see some people we haven't seen in a while! Patmc, glad to hear you are okay. Hope all the SoCal LOSTies are doing well, and not too shaken up. Glad you and your shrine are okay, Patc! The quake swayed my chandeliers and last for a long time (I heard 25 sec.). But you're much closer to the epicenter and I'm sure felt it stronger than I did. It's now been upgraded to 7.2! And they're saying the whole area is very active seismically now! Saw some video of the quake on the news-water sloshing out of a swimming pool- yousa! Best to all in CA. Oooo, a shiny new post! Best wishes to those in the earthquake zone. Hope there's not too much damage! I defied myself and opened up my lost toys and displayed them in honour of patmcs awesome shrine. Not as cool though. My lost wall is also in honour of lottery tickets and andalones but alas it looks no where near as cool. Thanks everyone for all the nice comments regarding the earthquake. Luckily, there was very little damage. Southern California has some of the toughest building codes in the world, and yesterday showed exactly why it is that way. As a Californian, I'm used to quakes... but this was definitely the longest I've ever experienced. It was almost a full minute of shaking, including a few very large jolts. Pretty freaky, because you just don't know when it's going to stop. Not huge strength, but the shaking was strong enough to make you start to worry. @JustThinking - I texted my friends who are in El Centro (which is much closer to the epicenter of the quake) immediately after I saw where the quake was, to see if they were OK. She told me that her apartment had been hit with a mini-tsunami when the water in the swimming pool sloshed out, and ran right into her place! I'm still waiting for some pictures. If you scroll down, you can click on individual earthquakes... including the 7.2 monster that kicked off all the activity. If you look at the direction the activity is spreading... notice that it is just about to touch one of those thin red lines. That line is the Elsinore Fault... which runs within about 15 miles of my home. We're hoping that everything stays south of the border! I was driving to Easter Dinner and we never felt the quake, of course, we went over some big bumps and one of those could have been the earthquake. ? More good news: Lost won Hulu's best in show! woohoo! That is good news...but not surprised. Lost is the best show ever. Glad to hear all is well with our west coasters. Happy LOST Day everyone! Can't wait to find out more about Des tonight! Had another aftershock last night, but I think the worst is behind us now (knock on wood). Nate Duval had The Barracks up on Etsy today. internet working, but showing off. Going a bit too fast for a computer that hasn't worked for 4 days. My first negative experience with a Mac! Anyway,i'd like to extend a special Happy LOST day to Maven! And a Happy LOST day to all the people we haven't seen in a long time. Rev Milo, Thorsten, MiddayShadows, Zort and anyone else I have stupidly forgot! Very happy I got the Ab Aeterno poster and I think a few other ARGers might have gotten it also. @patmc, you might want to delete that. There are people who are still spoiler free about tonight's centric. Don't worry about it, it's mainly the aftermath that all you americans leave on twitter and facebook I have to avoid, otherwise my mind gets pre-blown and I feel slightly disappointed in an episode. Best definition of mind pre-blowing: Everyone said Pulp Fiction was an amazing film and I really should watch it. Happy late Easter to all. And I just learnt there was a Spaced poster by Tyler Stout??? Seriously? I now have to spend my evening trying to track one down. I just can't get out of this poster buying business!!! Happy LOST day folks... enjoy. Picked up Smoke Break from Bob The Framer at the weekend. Lovely. I was browsing the Lostpedia forums, and they've been having a countdown to tonight's episode since December. So I'm thinking we're in for a good one, since I haven't seen any other countdowns there. I'm really, really hoping tonight's episode has some kind of game changer. @Amy Lynn: sounds like it will be, judging my Carlton's latest tweet. I'm very sorry! I thought that since we all got to see him with his head hanging off of the dock last week... that it was a bit implied. I always try to be spoiler free... especially as I have friends in the UK. @Ray... just checked Carlton's tweet... A. MEN. @Patmc, yeah, fairly obvious. However, there's still one main character who hasn't had a centric, and several times this season we have left off somewhere, only to pick the storyline back up two weeks later, instead of one. Don't worry about it Patmc, I was spoiled for whose episode Ab Aerterno was and I still think it my favourite of the season so I can only imagine this one will come as close! I guess I can roll my mouse over the countdown timer to see the name of the episode now. Seriously, it's cool, barely a spoiler! Random schedule comment. The "off" week that was scheduled for May 18th was moved to 4/27, instead. There'll be a repeat of "Ab Aeterno" on 4/27, and that's it. Another wall space issue: Just picked up Dan McCarthy's new print, Pink Moon. Loved it right away and bought it on impulse before I could change my mind. It got a loud WHOA from me as the image loaded in the email but it's just a bit too pink for me. I am staring at it though, trying to convince myself otherwise but no, I will be resisting this months print. I joined Dan Mccarthy's print club last month. Love the new print. The one i'm saving my money for is the Tim Doyle Ghostbusters print. Glow in the Dark of course. Every time I look at it, I can hear the siren blaring from the wagon! Also, I visited the fire station when I was last in New York so it's got dual meaning to me. Sadly, I can't convince myself with the Barracks in the same way. Oh gawd, Amy Lynn. I'm so psyched for this ep now. Sam G - McCarthy's Pink Moon is very nice. I just emailed the link to Dan's site to my former supervisor earlier today. I'm hoping to convince her (in a nice way) that she really should consider buying one of his prints for her new office. Far be it for me to tell someone what they should consider as art ...but I'm SURE you won't find it at the local discount outlet. ahh tonights episode was so good!!!!!!!!! That was amazing!!!!!! Even better than Ab Aeterno!!! And Desmond is trending! UKers you need to find a way to watch the ep as soon as you wake up! Here are some pictures of "The Crash" and "Locke's Secret" that I got back from the framers last week! Holy cow, is my head spinning! We just finished, and my wife and I are about to start our re-watch! And the aftershocks aren't helping! We just had 2 aftershocks, only 12 seconds apart! Sheesh! I feel so freaky tonight! Forget DCaaPB prints! I'm even more of a fan of the Sam & Max Hit The Road poster! Jeffrey, nice job on your Crash and LS, they look superb. I get free high-quality printing at work, so I had the Sam and Max one made! I'm STILL trying to get a handle on last night's episode... even after two viewings! I can not believe that everything gets all wrapped up in 5 more episodes! Where'd you get the taweret? Is that one of the replicas that I see on ebay occasionally? I got to see the real ones at the Gallery 1988 event, and I'm almost certain that the person I got my replica from, created a mold off of one of the real ones... and just makes additional copies to sell, from the mold. Pretty good scam... er... idea. LOL! I don't remember which of the LOSTarg folks who were at the event, got one of the Statues (except LotteryTicket, who donated hers to the Autism fundraiser). If anyone here has one, maybe they could make a mold, and sell them to others here for a little bit more reasonable price. If anyone does have one, I'd be happy to walk them through how to make a mold themselves. Actually... I'd love to get a mold for myself, to make some for the folks in my local LOST group! If anyone has a genuine Tawarete, give me a shout... It would be awesome to let more folks from here get one! Let Operation "Little Man" commence! hahaha! I also saw today that ABC is now selling sterling silver "Drive Shaft" rings... like Charlie wore. They look awesome, but they're $165! I actually have a plastic one, that I got as part of the LOST Fan Club (which folded after Season 1). I have been thinking about making a mold of that, and trying my hand at some metal castings to make some copies. It's quite a bit more complicated than resin or plaster casting, so I'll have to see how much it would cost to put all the materials together... and figure out if it is still worth it. On a side note... has anyone else noticed how much more LOST merchandise ABC has this year? Why in the hell haven't they been doing this for the last 5 seasons??? There seems to be new products emailed to me every week from ABC, inspired by last nights episode. Seems they've only just realised that we tend to buy anything lost related, lol. My problem with the ABC merchandise is that it's completely uninspired? I could go on Zazzle or CafePress and come up with something more than a bunch of crossed out names on a t-shirt. I MUCH prefer TeeFury, which employs real artists to make LOST tees. Bah! Just had another moderate earthquake. Looks like a 5.3, in the exact same spot as the original 7.2 quake that started all of this shaking. I REALLY hate earthquakes at work! I'm on the 5th floor of an office building... and earthquakes don't shake the building like it does in a single story building. The motion is more of a side to side swaying motion... and it is VERY disorienting! It feels like your equilibrium is off-kilter... and it makes me dizzy. I think that's why they let the fans go to town on Cafe Press. Patmc, I purchased one of the replica Tawerets from the ebay seller as well. I love it even though it is a knock-off. Taweret is such an iconic symbol of the show (and just plain cool! )I display mine in an acrylic case intended for bobbleheads. I have been a LOST TeeFury junkie as well, so have purchased a couple of the designs in XL to make into throw pillows. WWJLD and DUDE are on the sewing table now. I think they will add a nice touch to my LOST room. Will post pics when I am done. I am really behind on personal projects. Work keeps seeping into free time. You guys hear about that petition to JJ Abrams to continue Lost? Totally NOT on board with this. The Producers have tried very hard to make this a standalone story and I think continuing something that is already so great would be disrespectful. I'm pretty sure JJ Abrams is on the same page, but I'm surprised so many people feel so strongly that it should continue. I've got a bunch of the Mego Trek figures, so I'm very tempted to pre-order Jacob & MIB. I only wish Entertainment Earth's shipping to Canada were a bit more reasonable. Im watching the latest Lost video podcast (08.04.10). Anyway, in the first 10 seconds of it, there is a preview of the MIB/Jacob action figures. They actually look ok compared to Locke, Hurley, Kate and Ben. They don't look brilliant but there's a better choice of clothing chosen for them. $40 to ship to the UK??? No, I think I'll resist this one. Has anyone seen pictures of the figures, seeIng as EE says image coming soon? @Patmc - Haha. I would get it but I much rather have the bobbleheads. :) The only one that I have is Benjamin Linus. A month ago, I saw is on eBay selling for $103. Luckily I got it early. Well that's annoying. $36.95 to ship to Australia. @Martyn - The figures are in the new Lost Video Podcast. They are shown in the first 10 seconds. People really just have to learn to let go. They did the same with Harry Potter. The bet stories have a definite end. Got my stuff from Dr. Mikey today, pretty cool! Giving the print to my mom, she's got a huge crush on Alpert. Got legless taweret plopped up on my desk. Ahh, will check the podcast out later then. As for the toys, I reckon I'll have to do a bulk order to justify the postage cost. Hmmm, maybe I'll get the hurley and john Locke bobbelhead to go with my haliwax bobble. May throw in Richard Alpert and faraday if they're still available. If any UKers want to add to my order and split the shipping, let me know. Just going to see if shipping increases the more you add first. Ok, I'm just going to order the Jacob and MIB as it's getting stupid with the postage costs. So if anyone in the UK wants the Jacob and MIB figures as well, let me know as it works out cheaper for us both. Hi, all. Ray, "Legless" I like. Going to plop mine in red-carpet sand diorama. lol Spent an hour at framers, (got lots of weird looks and could not even begin to explain) for the balance of LOST 'other' art. Received a nice note today from the LOST fan who donated to Autism Speaks for the statue. Turns out he is a member of the Dharma Dummies (www.dharmadummies.com). So cool. We've known each other virtually and now have a new connection. @Martyn - There are now pictures of the figures on the site. Description: Carlton Cuse and Damon Lindelof, the creators of LOST, will have an in-depth live discussion about the show's creation, its six years on the air, and its finale on May 23, 2010. The TimesTalks Participants include Award winning Carlton Cuse, who currently executive produces LOST, along with Damon Lindelof, the co-creator and executive producer for the LOST series. The discussion will be interspersed with video clips from past shows as well as a one-minute sneak peak from the finale. The discussion will be followed by a 30-40 minute Q&A with questions taken from the live crowd at the NYT Center, pre-submitted fan questions and questions texted from guests on event night. Guests will be offered the opportunity to text in a question. @Martyn - Yeh, overall they are pretty lousy. Dammit. Why did McFarlane stop?!?!!? I still need to collect Series 2, Locke and The Hatch. I think someone said it was because series 2 didn't perform very well. I don't even remember them ever being released to be honest, they sort of slipped under the radar. I was waiting for the eko one and was looking forward to desmond in series 3. I just need the hatch, jack, Shannon and sawyer to complete my macfarlane collection. I'll put them on the backburner for a while as I'm trying to complete my Gorillaz kidrobot collection and failing with the two most popular ones. All this stuff came out when I could only afford one you see. Yeh... Its such a disappointment that Series 3 didnt come out. I would have loved to have the 'Plane Crash' diorama and Desmond. Was there supposed to be a plane crash diorama? That would of been awesome! I have LOST, Smokey or Walt. If you are interested, email me at dvdbos@gmail.com. Remember i'm in Italy. Sorry about the car, Davide! Haha, Claire really? They need to do a Desmond one, stat. I mean, who's mind bobbles more than his? Re Claire and Squirrel Baby bobble-if they run out at Comic con- does that mean no one who preordered will get one? Is it first orders in first filled if they have some left over? @Just Thinking - I think pre-ordering now reserves one. The preorders will be deducted from 1500 quantity. I preordered Ben last year, and he shipped about a week after Comic Con. Darwin (mine) and Seymour (andalone's) by @house_of_darkly or as we know her, Anne! another brother to be added soon! As always... It's only available for 24 hours (Tuesday, April 13th), then it's gone forever! So if you like it... don't delay! Bobbleheads... So awesome... When did the bobblehead craze (for tv shows) start? Dwight Schrute's Bobblehead from The Office? Exciting day yesterday, I received 3 LOST prints in the mail. First, "We Have to Go Back" by Jimmy Goose -- there's something magical about this print that I really like. Second, Tim Doyle's "The Numbers" a.k.a. "Hurley's Curse" which I purchased off of eXXX for a decent price. Still not one of my favourites style-wise, but it does look kinda cool in person. Finally, Branden Otto's "Candidates", which looks just as awesome in person as it does on his site. "Candidates" is actually the first print of a two-print diptych (forgive my redundancy). The second print, "Just Progress" is up for sale today at 2PM EST. Looks like Branden will also be selling six 2-print sets today, so if you missed Candidates you've got a second chance.